Archaeological evidence shows that the indigenous Coast Miwok people inhabited the area now known as west Marin County for at least 3,000 to 4,000 years before Spanish missionaries and settlers arrived. The Miwok, one of the most populous native groups in California, have a cultural heritage that includes shamanism and complex, elaborate languages. The Coast Miwok lived on nature’s abundance, sustaining the land and coastal waters by fishing and hunting only for what was consumed and burning the grasslands after their seed harvest to encourage new growth. European explorers began incursions into Coast Miwok tribal lands in the 1500s. By the 1700s, the Spanish mission builders had forced many Coast Miwok natives into servitude. The land was taken over by Spanish and Mexican land grantees, and many Miwok tribespeople died from diseases introduced by the settlers. Today, Miwok descendants continue to live in or near Marin County. The 1848 discovery of gold drew fortune-seekers to California. The son of a paper mill owner on New York’s Hudson River, adventurous Samuel Penfield Taylor purchased a schooner with some friends and set sail for San Francisco Bay. Upon arrival in 1849, 22-year-old Samuel found a wooden cask filled with eggs floating near shore. He cooked the eggs and set up a food stand on the beach. Food sales proved profitable. With his earnings, Taylor and a partner opened a lumberyard in San Francisco; two years later he left for Hawkins’ Bar, Tuolumne County, to pan for gold. In 1852, at the peak of the gold rush, Taylor shipped just over 21 pounds of gold dust to his San Francisco bankers. The dust netted Taylor $5,692; that quantity is worth more than $400,000 today. Taylor found and purchased 100 acres in western Marin County from Mexican land grantee Rafael Garcia. 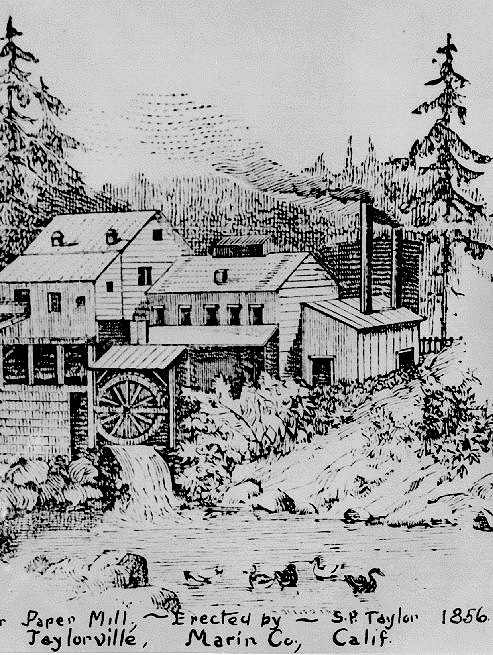 Drawing on his father’s paper mill experience, Taylor opened the first paper mill on the west coast. The Pioneer Paper Mill Company used rags, rope, jute, and wood pulp to make paper. The company grew rapidly due to demand for paper and expense of importing it from the east coast. The bustling community of Taylorville grew up around the paper mill. 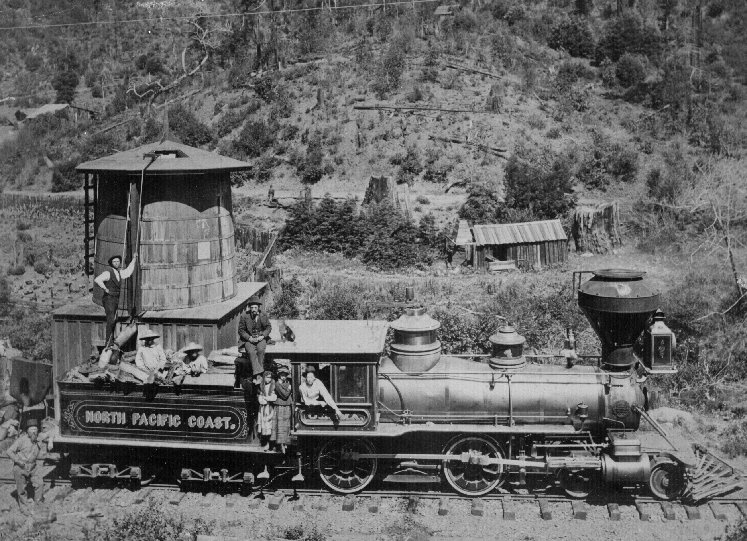 In 1874 the North Pacific Coast Railroad built a narrow-gauge railroad running from Sausalito through Marin to serve Point Reyes and Tomales Bay. The route was important to commerce and brought tourists to the area. 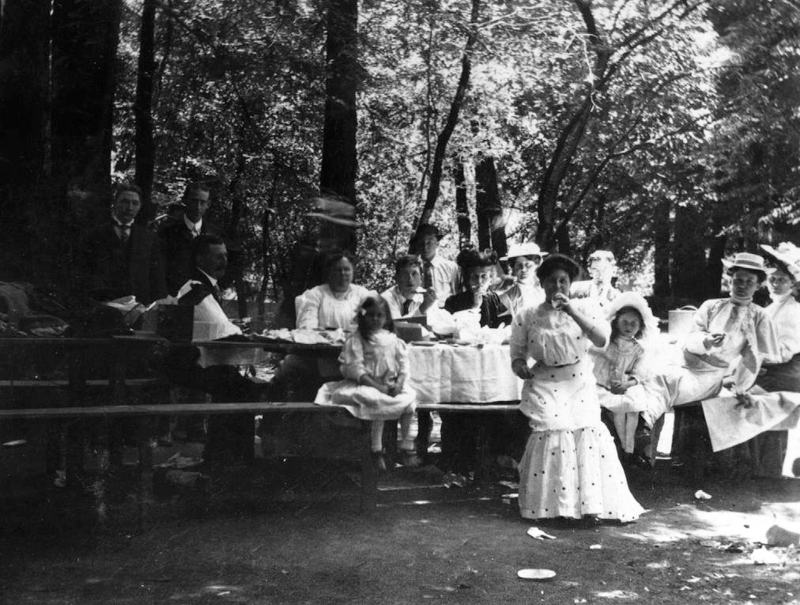 Camp Taylor, one of California’s first recreational camping sites, became an extremely popular northern California weekend destination from the late 1870s to the early 1900s. Guests were encouraged to spend summers in the wilderness, where they could camp, swim in the millpond, fish, hunt, explore the natural wonders, and relax. Taylor died in 1886, and his family eventually lost the land. By the 1920s, the mill and camp stood abandoned on about 2,500 acres of land. Then-owner Elizabeth Rodgers wanted to donate the land to Marin County in 1924, but county officials turned down the logged-over acreage. Members of the Marin Conservation League proposed that the county purchase the land for recreation in 1935 and worked tirelessly toward that goal. Mrs. Rodgers sold the land in 1945, and Samuel P. Taylor State Park was opened in 1946.